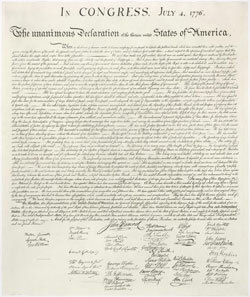 Drafted by Thomas Jefferson, the Declaration of Independence opens with words that all Americans today feel (even though they're not part of the constitution) form the essence of the United States of America and should forever be taken into consideration as such by any leader aspiring to a public office. Yet, when Thomas Jefferson and the founding fathers drafted the document, they didn't specify that those self-evident truths applied only to Americans, but to "all men", meaning "humanity" (even if the definition of humanity at the time wasn't the same as today). LLH - "Life, Liberty, and the pursuit of Happiness." These words are all capitalized for a reason. Jefferson wanted to make sure they were understood as essential, important, so let's look at them carefully, starting with Life. For a nation founded on the unalienable Right to Life, as Americans, we certainly love to kill. We don't defend ourselves, we attack. We worship violence, celebrate it, love to watch it on TV, in sports, in events, and in games, video or otherwise. We love death, celebrating it, worshipping it, putting it on a pedestal, and bringing it to others, with no remorse if it's on foreign soil. So much for the right to Life. Liberty from a country that incarcerates the largest amount of people per capita than all other countries of the world is so laughable as to make anyone cry. If Jefferson were alive today, he would have asked for a redress of grievances, and when everyone laughed while asking what the hell a redress of grievances was, would have organized a revolution to defend the country from our tyrannical government. Make no mistake. Our government is a tyranny. It has been for a long time, and we have accepted and tolerated its existence. Liberty is a mirage and our grievances will never be redressed. The Pursuit of Happiness is everyone's most quotable favorite of these, but what is the pursuit of happiness? This obviously means different things to different people. It is for this reason that the pursuit of happiness must be globalized and simplified to a number of general ideas like the opportunity to work freely and earn money, to eat and sustain yourself, to pursue enough comfort to survive and live in a secure environment, without worry of pursuit or discrimination by others, etc. The constitutional bill of rights in theory covers some of these protections that are meant to guarantee your Pursuit of Happiness, and yet, a number of politicians labor daily to end these protections for their own benefit, their Pursuit of Happiness, NOT yours. The combination of these three items are at stake every day in our democracy, but we allow them to be constantly violated without complaint. We ourselves love to highlight these items as the core values of the American people, and yet, we ignore these values both with ourselves and with the rest of the world. If we are to honor these "self-evident" truths, then we must truly hold ALL of humanity equal, and if the right to Life, Liberty, and the Pursuit of Happiness is truly to be unalienable, then we cannot so blatantly take it away from others both at home and around the world. Life, Liberty, and Happiness. Life, Liberty, and Happiness. Repeat it one last time: Life, Liberty, and Happiness. Think carefully about each one, and what each one means to you. Should you think these unalienable rights given to all humans in equal standing, then how does that affect your life, your government, your world? What are you willing to do about it? Keywords: Life, Liberty, Happiness, Declaration, Independence, Humanity, Pursuit of Happiness, Declaration of Independence, United States, America, United States of America, USA, US, World, Government. Thomas Jefferson biography by Christopher Hitchens on Amazon.com. Declaration of Independence entry on Wikipedia. Transcript for the Declaration of Independence on Archives.gov. American Civil Liberties Union (ACLU): "The ACLU is our nation's guardian of liberty, working daily in courts, legislatures and communities to defend and preserve the individual rights and liberties that the Constitution and laws of the United States guarantee everyone in this country." Checks and balances - How does our system of checks and balances is supposed to help in protecting our rights. Givemeliberty.org - Site dedicated to a redress of grievances and to the constitution lobby.